One of the great things about living on a boat, is the ability to anchor just about anywhere you like without the need for infrastructure like a marina or mooring balls to tie up to. 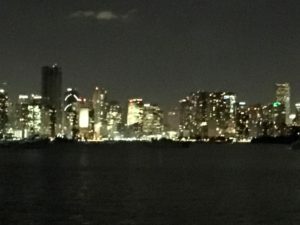 Drop anchor in front of a big city like Miami for access to the same views and facilities as the 5-star hotels, or find a tropical island all to yourself with only the sand and sea life to keep you company. This also creates one of the potentially biggest hazards you can face while on a boat, namely, “What happens if we drag while at anchor?” Of interest, this just happened to the former boat of Mike and Rebecca Sweeney, a couple that inspired us to get interested in the cruising life. So how do we avoid this potentially catastrophic event? Like a lot of other important aspects of the boat, the majority of work is done before you actually need it. In our case, we broke the topic down into three parts for ease of tackling this subject as we did for others: education, experience (our own and others), equipment considerations, and then maintenance of all three. 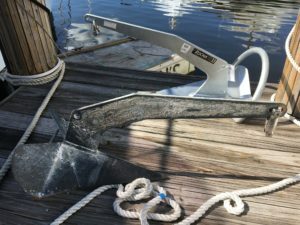 When we bought the boat, it had the factory 165′ X 3/8″ anchor chain and a 55lb plow anchor, which we think is a Lewmar Delta. Plow anchors have been around for many years, and are very popular, but they are also famous for being very effective at…plowing, which obviously involves moving while they plow. 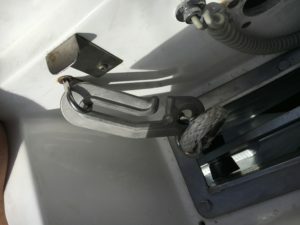 The captain taking care of the boat for the previous owner felt the same way, and expressed his frustration at dragging all over the place in windy conditions, so he convinced the owner to use a large 70lb claw anchor instead. We knew we wanted to replace the plow, and would like more chain, but for the very shallow Bahamas during our first season, 165′ would be enough. From the wide variety available, we narrowed it down to either a Rocna or Mantus anchor, which are both very similar scoop/spade-type anchors, but in the end settled on the Rocna for it’s popularity and duration in the market, as well as the fact that Mantus comes apart into individual components. This is good for shipping and storage, but it also means it could come apart in its individual components just when we don’t want it to. 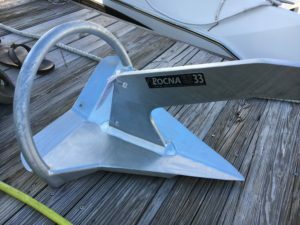 We selected a Rocna 33kg/73lb galvanized anchor due to recommendations from a few people, and there are many similar make and model boats that have made the same choice. 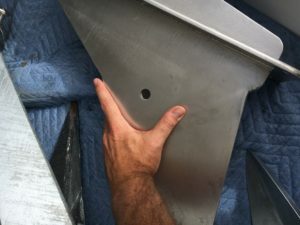 Due to the extra length and the large self-righting hoop on the Rocna, we needed some custom work to ensure it fit securely on the anchor roller of our boat. We had this done at Just Catamarans along with a bunch of other work. The first picture shows the amount of material on the stock roller above my hand. The second picture shows the additional material that was added to allow the lower roller to move down and forward approx 6″. While we went with Rocna for the anchor, we did get a Mantus Swivel to use with it. We also got an elongated bridle hook. 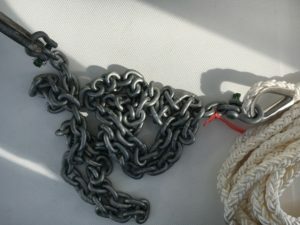 This makes it hard to put on and remove from the chain when anchoring, but it also makes it hard for it to come off if it drags along the bottom. This hook was on the end of our factory bridle, that looked like this. 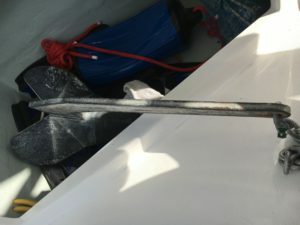 The length was much too short, and the resulting angle at the leg was much too big causing us to yaw as much as 45 degrees either side of the anchor chain on gusty nights. 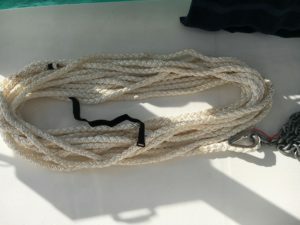 As most catamarans are designed for the charter market, they have designed items like this bridle for “ease of use” for either anchoring or mooring. Effectiveness is less a priority. 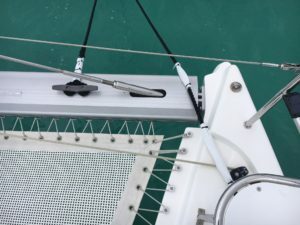 A normal monohull boat on a single point anchor line will try to turn abeam the wind and waves. 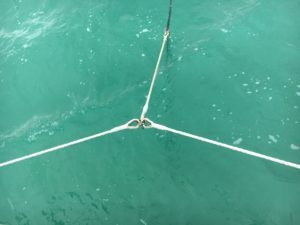 When this turn happens and causes sideways movement, eventually the anchor line will tension and cause the nose to swing around the other direction. 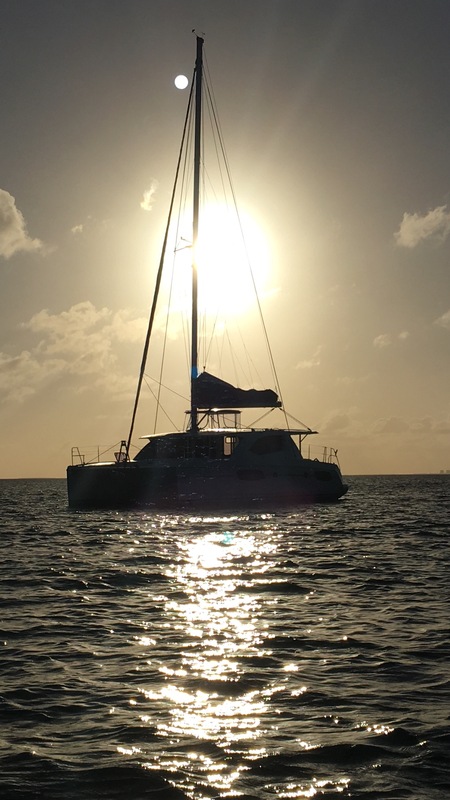 Catamarans are faced with the same dynamics at anchor, but they have two hulls both vying for the dominant position each reacting from the wind and waves. 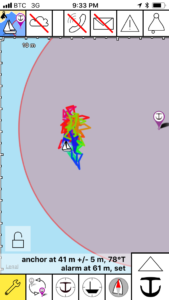 Add a current from a river and/or tide and the movement can get real interesting. The way to reduce this yawing is by using a bridle, but to lengthen it to the point that you try and maximize both static and dynamic stability. Static stability is when something tends to remain in a given position. Dynamic stability is when something tends to return to its original position when a movement is imparted on it. The first night we used them, we had approx 18′ a side, and the yaw went from almost 45 degree a side to less than 15 degrees a side. We would like to use even more length, but we are limited by the length of our lines to 40′. 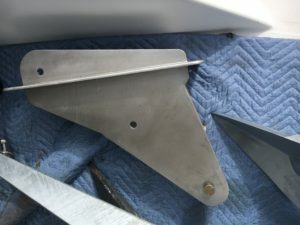 One of the interesting designs of our boat, is that the bow cleats aren’t actually on the bow. They’re set back almost 4 feet, just aft of the forward seat you can see in the pictures. This reduces the amount of line we can let out, and it causes a few contact points that we have to protect with chafe guard. We only bought some cheap fire hose chafe guard through Amazon to have in our spares bin just in case, and it has been holding up quite well. 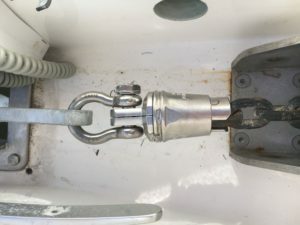 Eventually, when we find some high quality stainless thimbles that we can splice into our 3/4″ lines, we’ll attach one end to the original bridle mounting point with shackles at each end of the cross bar. A little easier and neater looking. For our secondary/emergency anchor, we took what used to be the primary anchor and added 150′ of multi-braid rope with 10′ galvanized chain with shackles at both ends. 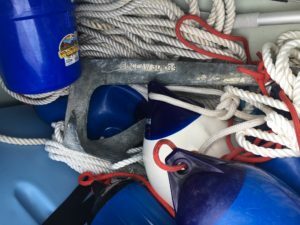 This can also be used as a stern anchor, which could come in handy with some of the strong tidal currents we encounter in The Bahamas. The secondary anchor sits in the stern locker that had been used to house the life raft before we moved it. We also still had the big 70lb claw anchor, so we added 100′ of 3-strand to it with a shackle, and this is now our tertiary anchor. The last bit of our gear is actually an app. It’s an iPhone anchor alarm call simply Anchor! Very simple to use, and we find the visual depiction a lot more intuitive than some other anchor alarms like Drag Queen that only use text. It has a lot of functions, but in short, you simply press the anchor down button to mark where you have dropped, and then adjust the radius of the circle you want to remain inside. 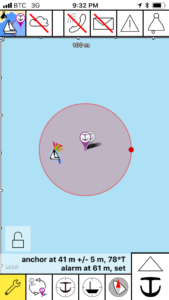 If the boat ventures outside that circle, an audible alarm sounds to alert you. It also has a snail/slime trail function that shows you where the boat has been tracked. The only downside is that you need to leave you phone plugged in over night as it uses up the battery. The most wind we’ve seen up to now has been gusts to 42kts. We’ve never yet felt the need to use the secondary or tertiary anchors leading up to, or during a strong blow. 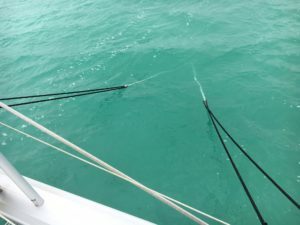 We’ve had the wind go through a complete 360 degrees, twice, while anchored in the same location, and we only had evidence of the anchor resetting itself over approx 3′ but didn’t feel a thing. 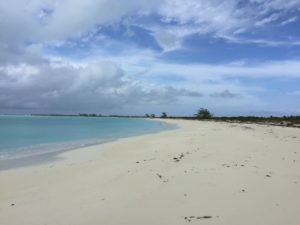 We always let out lots of chain, usually 7:1 or more, and sleep soundly in the knowledge out anchor won’t drag in the nice sandy bottom found in most of The Bahamas. Both are highly recommended reading that will give you a great head start. After absorbing the information contained in these books, you will likely have much more knowledge on the subject than those around you in the anchorage. Interesting read. Lots to learn in the sailing business! Hi Shaun. Yes, it never ends. I just realized I forgot to include our anchor alarm as well. Now in there.